My grandfather was a farmer. A large farmer, who farmed over 1000 acres with his children before he passed away. I was only 7 when he died and I don’t remember him extremely well, but there are certain things about him and his house that I will never forget. Like how his kitchen cabinets had hammered copper knobs and spade handles. Or how the bottom drawer to the right of the sink always hid Oreos or mini doughnuts (treats my parents sparingly would keep in our own house). He had a large collection of those now-retro Avon cologne bottles shaped like cars or trains (I have a green Jaguar bottle that belonged to him). His living room had the oldest oak floor television I had ever seen in my life with a remote control that explains why some people still call them clickers; each button was as loud as a dog training clicker. And I will never forget his living room lamp shades. I don’t remember what the lamps looked like, but I will never forget the two lamp shades. They were made from Styrofoam egg cartons arranged in a drum shape, one pale green and one pale pink. On each of the tall “points” that seperate the eggs, a hole was punched and a colored glass marble was glued over the hole. When the light was on, the glass marbles would glow. I had never seen anything else like it in my life. Until I Google searched for them. And sure enough, apparently someone else had some. This photograph is similar, only Grandpa’s had marbles on each of the points, not in the actual egg wells, and his two were on table lamps, not hanging. Not my style at all. But nonetheless, I will never forget them and how much of a statement they were in his living room. I wonder who it was that actually made them and where they ended up after his estate was divided. Not that I necessarily want them, but they would be fun to photograph. Check out these other egg crate lamp shades that are probably more likely to end up in a high end design magazine. 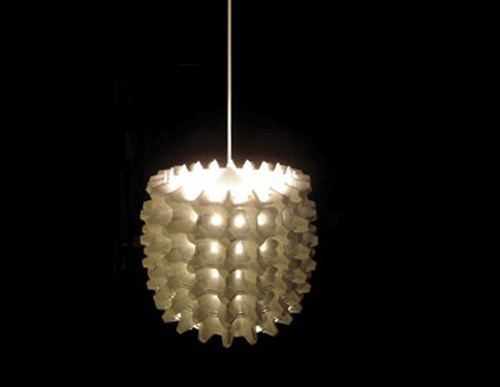 This first pendant lamp was featured on a great sustainability and design blog, Inhabitat, back in 2009. Very pure looking, this would probably be an easy DIY project. Check out the full post at this link, or click on the photo. I could easily see these more colorful lamps in a child’s room, glam bathroom, or chic home office. The shades are basically paper egg crates that were spray painted a bold color and folded into a drum shape. Photographed in a display by Recolector Disesno, they have been featured on the blogs DIY Gadgets and Apartment Therapy. I do like the white version, and it would be fun to make; but would I actually hang it somewhere? What do you think, are you inspired enough to start saving egg cartons? What other egg crate crafts have you seen or made? Now I know I didn’t mention car repair when I introduced myself and my blog in the first post, but my most recent DIY adventure has been replacing my passenger-side mirror. A few months ago (OK, embarrassingly I will admit that it has been since last December) someone knocked off my passenger side door mirror. When I first saw the mirror hanging only by the electrical wire, I immediately thought some student must have tried to park beside me but got too close. Then I realized I was parked in the last spot in the parking row, directly next to a busy sidewalk. So therefore I can only imagine that some disgruntled college student smacked my mirror off in frustration over failing a freshman level course (this occurred the last day of my next to last semester at Kent). So yes, I drove for almost 10 months with only my driver side mirror. After a college friend noticed I hadn’t gotten it fixed yet when we met for dinner last week, I decided it was time to act. I priced replacement mirrors right after the incident, but turned to the internet one evening last week determined to find a cheap mirror. After finding the mirror I needed at prices ranging from $35 and $89, I stumbled upon DiscountAutoMirrors.Com. It turns out they carried my mirror for only $16.95. The shipping and handling was steeper than I would have expected, but altogether the mirror set me back just over $30. It arrived quite quickly, just 2 full days later (explaining the high shipping cost). To begin, I had to remove the remaining plastic piece of the broken mirror. I was pleased to find it could be easily removed. I just popped off the triangular plastic cover inside the door and removed 3 screws. All that remained of the original passenger side mirror. The new mirror arrived unpainted. 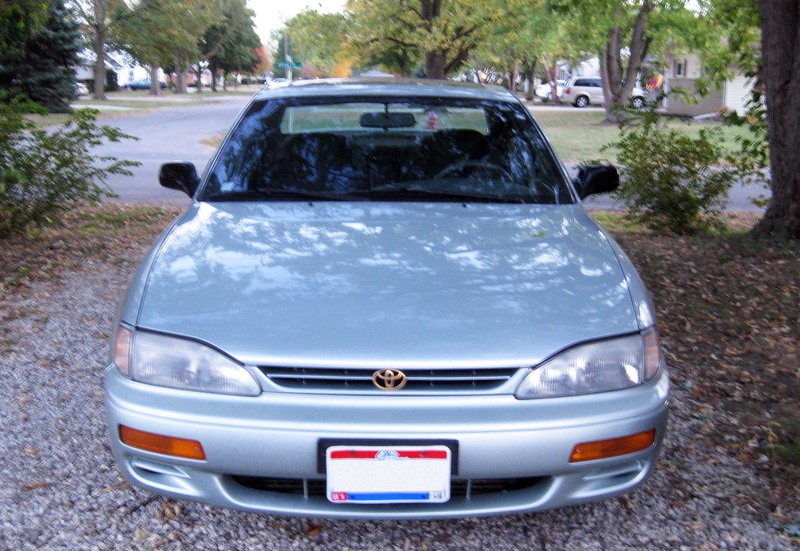 It turns out that purchasing aerosol cans of a 1995 Toyota paint color is quite pricey, and with light color vehicles a perfect match is highly unlikely because of years of sun fading. Black automotive paint, on the other hand, is only $6.99 for a small can at my local Advance Auto Parts store. The can instructed me to clean the area well, and buff with super fine sandpaper. Because I rarely (never) have 600 grit sandpaper on hand, I used super fine steel wool on the replacement mirror and washed it with rubbing alcohol (also recommended on the can). Because the driver side mirror was still the original car color (Silver Leaf, if you are wondering), I wanted to paint it black also. I first cleaned it extremely well to get rid of 15 years of bug residue. It turns out that my cheap dollar store degreaser called Greased Lighting is the best car cleaner I have ever found. While waiting for the mirror to dry, I actually used the degreaser on the entire grill and front bumper! 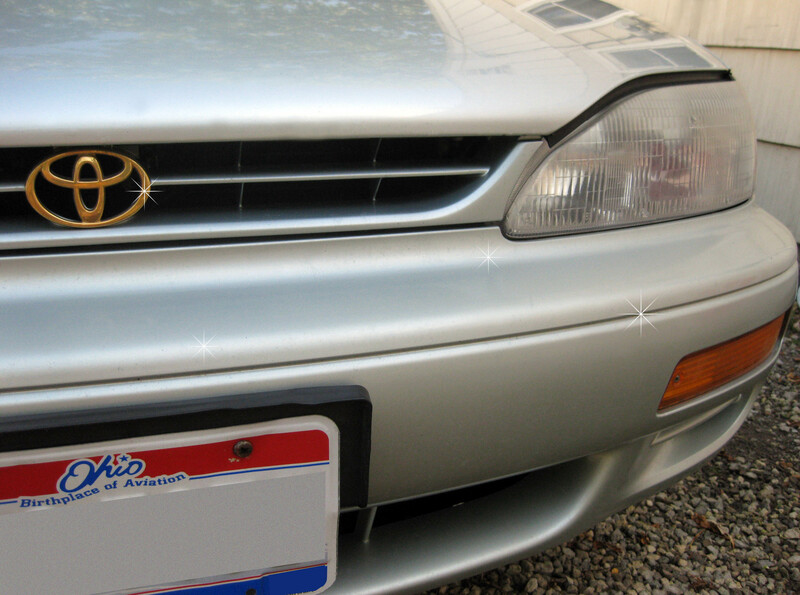 Have you ever seen a cleaner bumper! Cleaning the Driver Side Mirror with Greased Lighting. How shiny is that bumper? I mean, I was amazed. 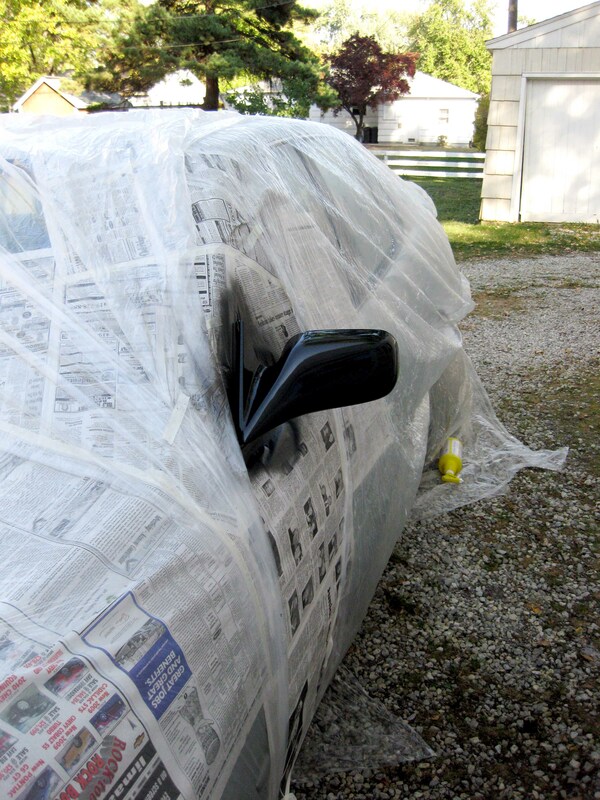 I carefully masked off the entire area around the driver side mirror with masking tape and newspaper, then covered the entire front, top, and side of my car with painter’s plastic sheets for protection against overspray. Now to the painting. 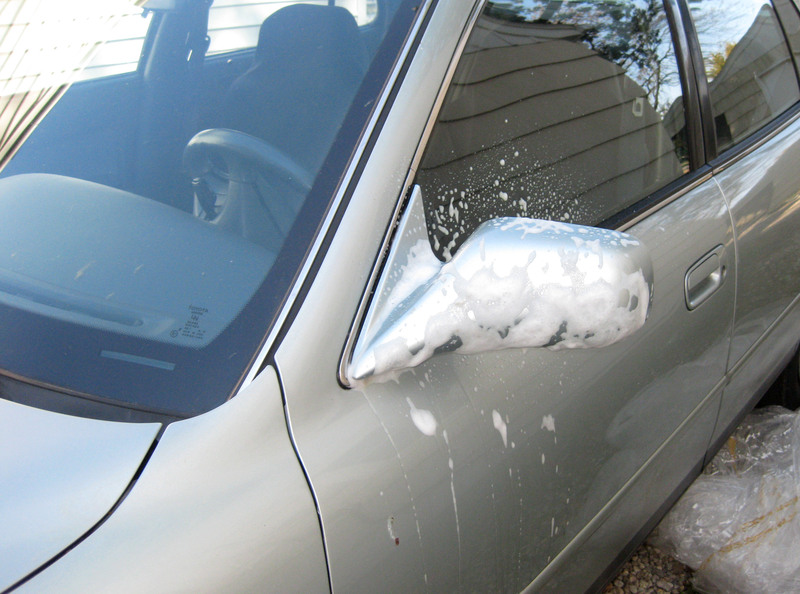 I gave each mirror two thin coats of paint, making sure to wipe the mirror free of dust with a soft cloth before each. The results were two mirrors with a deep, even black sheen. As recommended by the friendly associates at the auto parts store, I also purchased an aerosol product called Clear Coat for $6.99. This adds another layer of depth to the paint finish along with even sheen and an added layer of protection. An even layer of clear coat to both mirrors and all I had to do was wait for the finish to dry to reattach them. 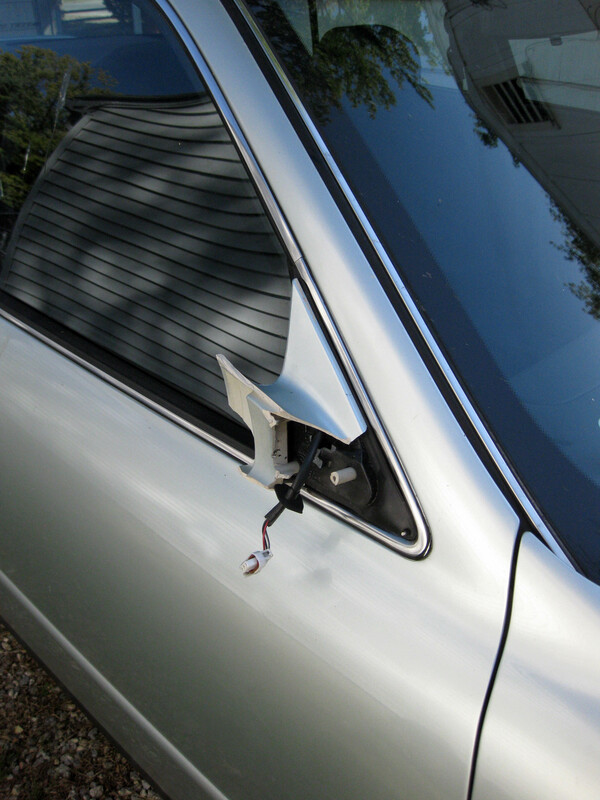 Finally, the steps to attach the replacement mirror: connect the wire from the door panel to the new mirror; attach the mirror with the 3 screws from the original mirror; snap on the small triangular plastic panel to cover the mirror screws. And there you have it, two beautiful matching black mirrors (and a super shiny no bug bumper!). From start to finish, this project took about 4 hours. That includes the time required for the mirrors to dry after being washed and allowing the paint and clear coat to dry before attaching the replacement mirror. In total, the new mirror and modifications to the original mirror cost a whopping $47.98. Thanks a lot to whoever knocked off my mirror back in December.